In this article we take a look at Kowa Kawa Halloween, which translates to “Creepy Cute Halloween,” and is aimed at families. With Kowa Kawa Halloween, kids can look forward to romping with the Despicable Me Minions who have transformed into monsters that are a little bit scary but more cute than anything. They will be playful like you’ve never seen them before. There will be several events happening throughout the day too for families to enjoy a full day at the park. During the day there will be a parade titled Festa de Parade as well as the Happy Trick Or Treat where candy will be poured like a waterfall for kids to watch. At night the park will hold its first ever Universal Wonderland Kowa Kawa Night. Festa de Parade was held last year too and was thoroughly enjoyed by guests. 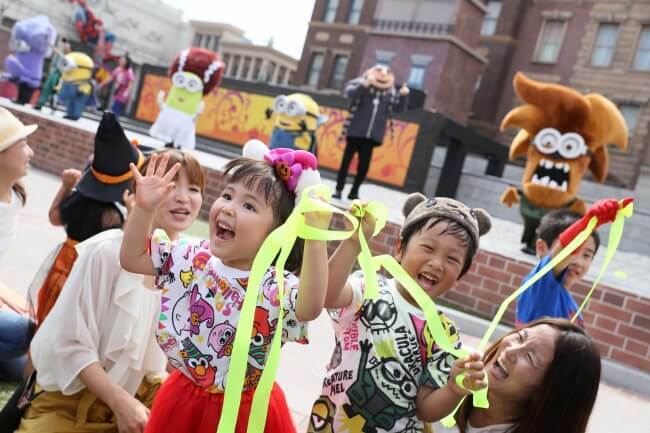 As well as the parade, they put on the first ever Minion “Kowa Kawa” Party Area where parent and child families of 800 people enjoyed the Minions putting on a stage show. It got pretty wild. Gru joined the Minions in the party area who were dressed in creepy cute costumes. Gru and the gang all danced to popular pop songs together while as the crowd cheered. As guests joined in with the party fun by dancing along, parade floats began to arrive. A total of nine floats came past all themed around Halloween. Confetti was shot into the air from the stage and floats, surrounding guests in the colours of Halloween. 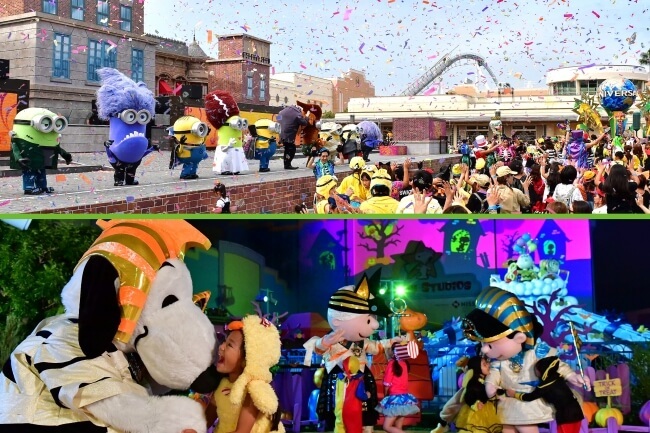 Despite the sun setting, Halloween was only just beginning at Universal Studios Japan as they introduced the park’s first ever Universal Wonderland Kowa Kawa Night. The walls of the park attractions are decorated with bats and spiderwebs. There are also creepy-cute projections and pumpkin decorations. It’s a completely different atmosphere than during the day. The characters too dress up in creepy-cute costumes. There’s much to be enjoyed at USJ this year for Halloween. Whether it’s Otona Halloween, Zekkyo Halloween or Kowa Kawa Halloween, you’re sure to get your fill of spooks!